FK Admira Praha is a football club from the Prague-Kobylisy district of the Czech capital. Football had been played in the area from 1007 where the Stírce tram stop is today, before the club was founded by the Staňkové brothers, Bedřich Koníček, Karel Šanda, Josef Hauf, Karel Havlík on May 17th 1909 as SK Meteor Kobylisy. In 1912 the club moved from playing by the local school playground to a new ground by the cemetery called U Sloupu. Following a break during the Great War, the club was renamed SK Praha XVI and then SK Praha VIII. 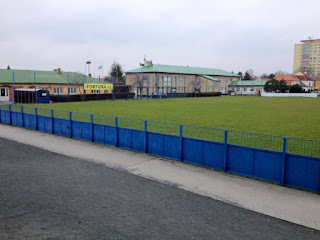 A split occurred in the 1930’s as some members formed Red Star; later Dělnický SK Kobylisy building their own ground near to the original school venue. A compromise was met and the clubs formed SK Admira VIII, with the name being chosen as Admira Vienna were the biggest club in Austria at the time, while at the same time allowing the old club to continue. The club soon grew with an attendance filling U Sloupa to witness a 4-0 win over Bohemians in 1939, as the team progressed. 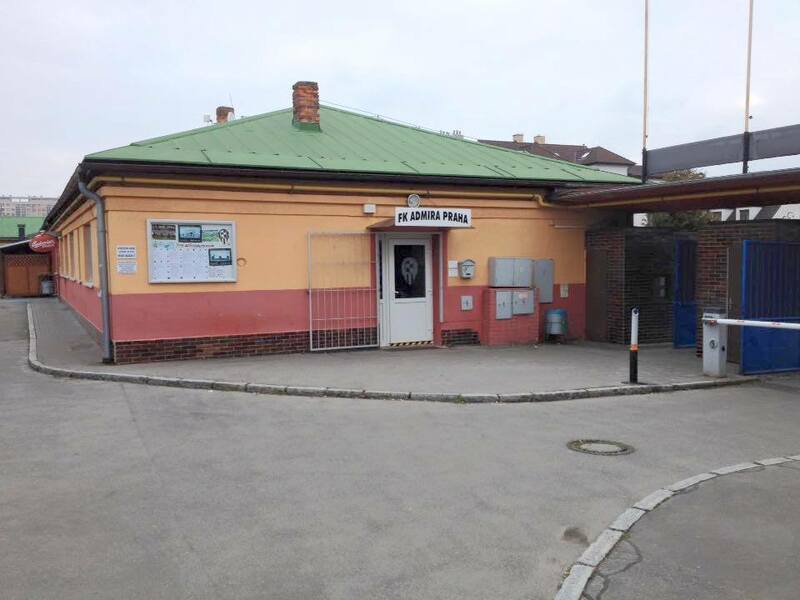 Another nearby club; SK Rapid VIII were formed in the Kopřivova pub in the spring of 1934. 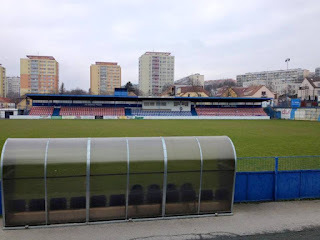 Rapid played at various grounds; Trojské ulice, Čimické ulici and then Admira’s Ládví home before merging with SK Praha. Admira and SK continued to play through World War II before coming together to become Vozovna Kobylisy. Communism under Soviet rule was now in control of Czechoslovakia. In 1952 the state decided that sportsmen should only represent the companies who employed them. This hit the Kobylisy club hard, leading to the withdrawal of an adult side in the second tier division. Loyal servants of the club ensured that the club lived on for three very difficult years with youth sides being fielded. Fortunately officials of the State Committee changed their rules in 1955 so adult football was restored to Admira under the new title of Dynamo Kobylisy. 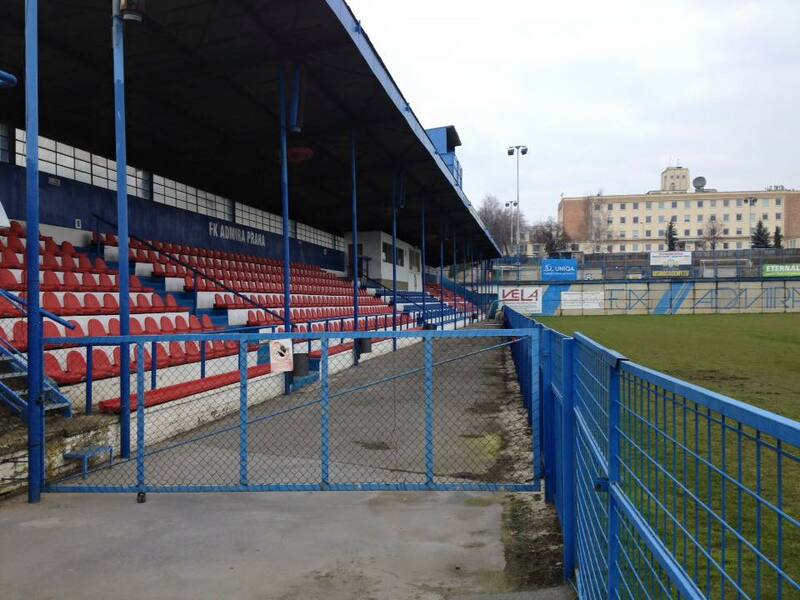 The old ground was rotated ninety degrees with help from the local council and the club placed back in the second tier B třídy. Under Coach Josefa Forejta, the team were soon promoted to the regional top level. 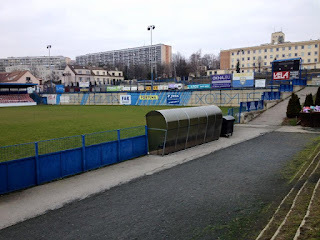 The regional title was won, leading to Dynamo playing in the second tier of Czech football in 1960, which was a remarkable feat considering that the club was close to extinction just a few years previously. Fans had worked long voluntary hours to build up the stadium to accommodate the crowds. The new step up proved to be too much for the team and they soon returned to Prague football. In 1969 a second regional title was won as the club changed titles once again; this time to TJ Admira Praha 8, with the 8 signifying the district in Prague where the club is located. Future Sparta and Czech Republic Head Coach Dušan Uhrin had a spell as Admira boss in the mid 70’s. The club finished in the top half of the geographical B and C groups before becoming regional champions once again in 1977-78. 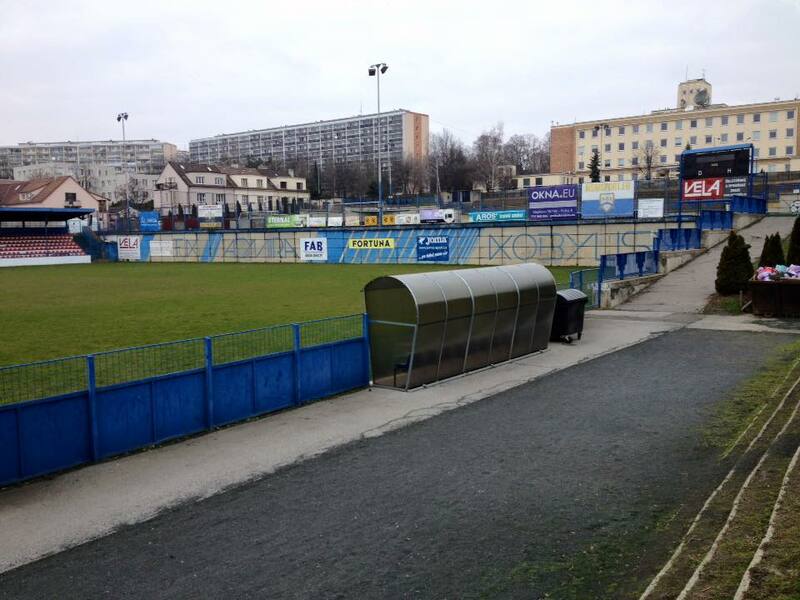 In 1980 the club became TJ Admira Kobylisy playing once again in national competition before relegation in 1989. It looked like things could get even worse for the club with a further relegation on the cards until a merger took place with nearby Slavoj Praha 7. The club was named FK Admira/Slavoj retaining Slavoj’s higher league status. In 1995-96 the team won the regional title once again. In 1996-97 the club joined the third national tier ČFL (the Bohemian Football League) with a first and a third place finish being the highlights of the following seven years as Admira became an established club once again. Another setback followed in 2002-03 as the pitch at the stadium required lots of work so Admira decamped to play some games at neighbours Meteor and Mratíně, which didn’t help as the club slipped back down to Prague football. There was reason for cheer amongst the Kobylisy locals in 2005 as Admira defeated Zličín to lift the Pohár Pražského fotbalového svazu (Prague FA Cup). A new artificial surface was laid on the training pitch, which adjoined the main stadium in November 2005. As FK Admira Praha, the team lifted the Prague championship in 2006 to join the 4. Liga. The club consolidated their position over the next few seasons before winning promotion back up to the ČFL for the 2013-14 season following a title winning season. After a decent first campaign in the third tier, Admira were once again relegated at the conclusion of the 2014-15 season to the 4. 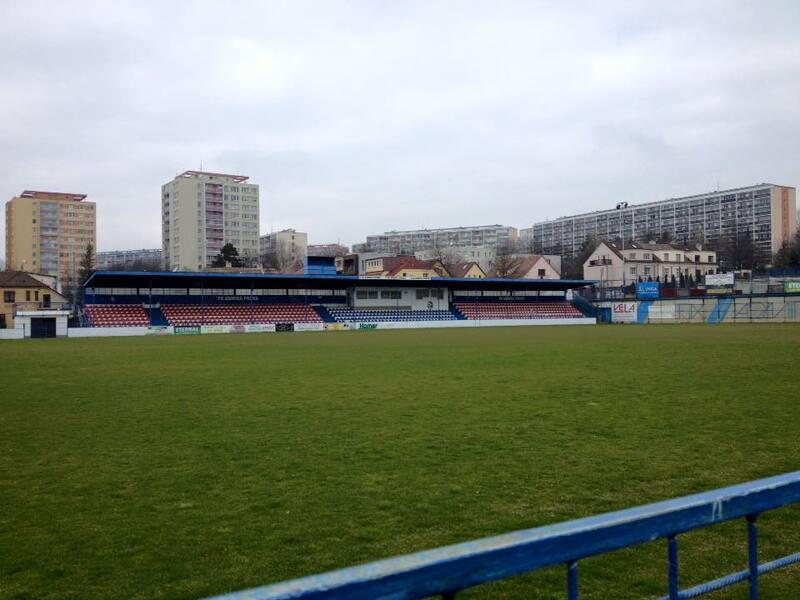 Liga Divizní Skupinu C, where they finished in third place on their return, just missing out on promotion. FK Admira Praha will play in the 4. Liga Divizní Skupinu A in the 2016-17 season. My pre visit research had marked down Admira for a visit, most likely to take in a game on the Saturday of my long weekend in Prague. However, in the week leading up I had to change my plans. 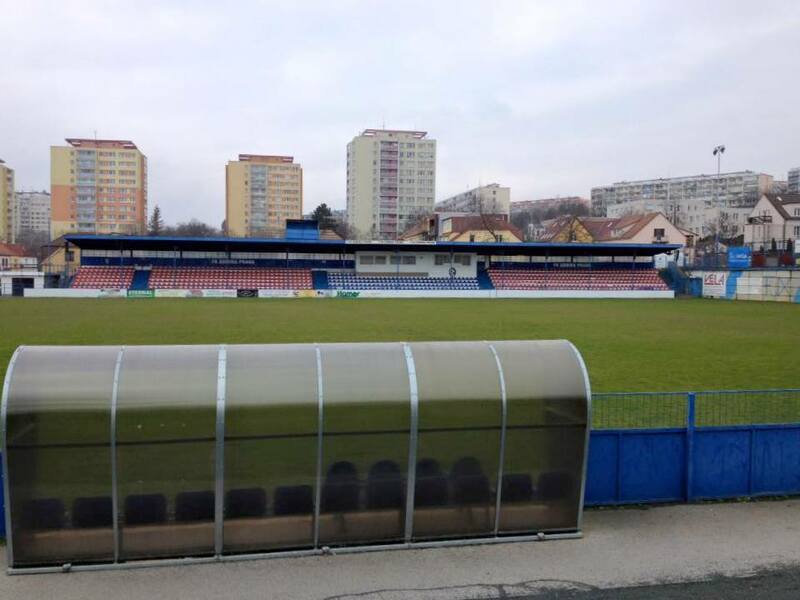 The football was resuming following the winter break, and I noticed that the match I intended to see against Ústí nad Orlicí had been moved from the main stadium pitch to an artificial pitch at Bedřichovská, probably worried about any inclement conditions. As it transpired Admira’s 2-0 win only attracted 100 spectators. 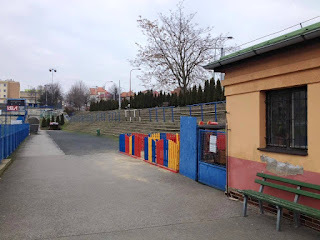 Anyway, Stadion FK Admira Praha had caught my attention with its fine main stand on the Soccerway website, so I pencilled it in as my first port of call on the Friday morning. I’d enjoyed a very convivial evening out in the bars of Žižkov a few hours earlier, but I was still up at 8am, not helped by completing a week of getting up at 5.30am for work. 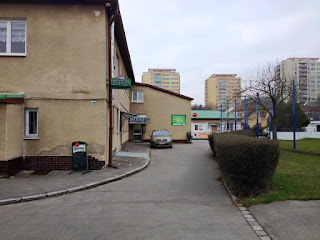 After grabbing a couple of rolls at the packed dining area of the Hotel Garden City Garni, I managed to make myself understood enough to buy a one day transport pass before jumping on a number 16 tram to Spojovací from the Lipanská stop, before changing to a number 10 around the corner to Kobylisi. 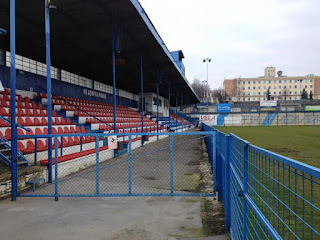 I soon found my bearings and within a few minutes I had walked up the incline of Na Pecich and entered the stadium through the fine open gates behind the goal. 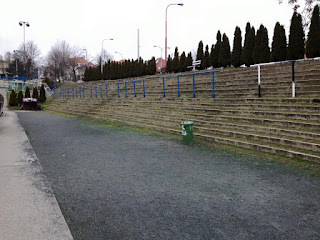 Stadion FK Admira was a fine arena with a full length seated stand down the far side. The top end had no spectator access, but a high wall with an artificial pitch above. 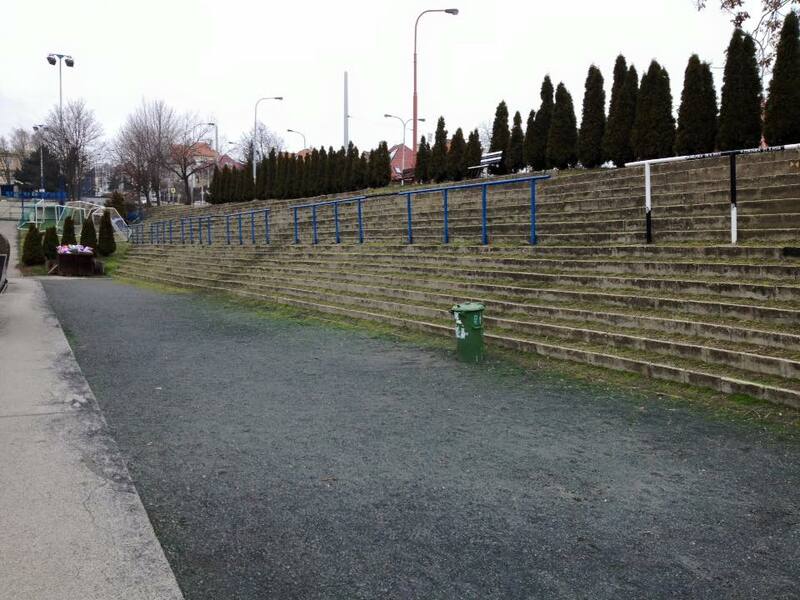 Opposite the seats was a section of open terracing which was set back from the pitch. 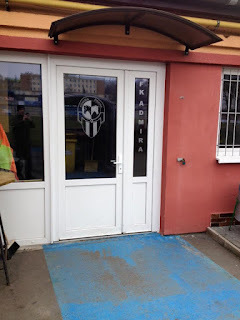 The entrance end had an area of flat open standing along with the changing rooms, club facilities and a clubhouse. 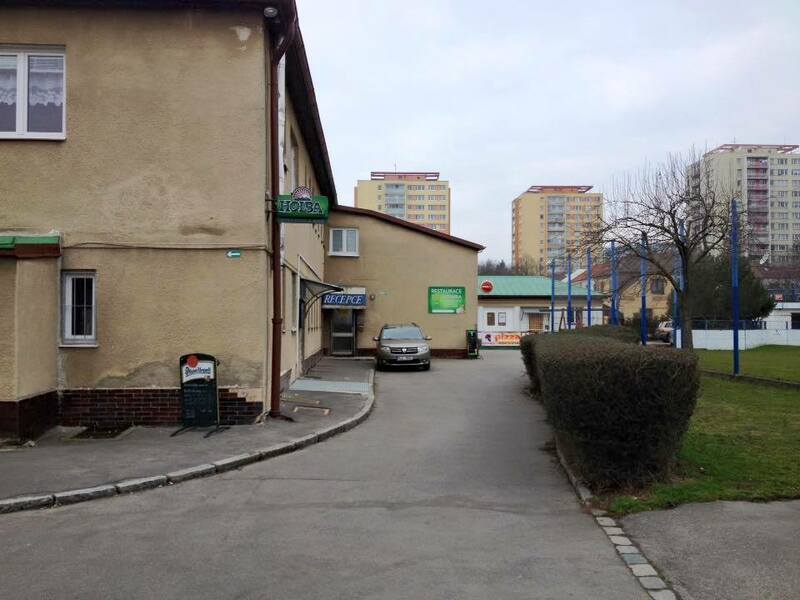 Once I’d taken all my required snaps I headed back down the hill and caught the number 10 service back towards town to alight at Stejskalova, from where it was just a short walk to the next club on my radar; FK Meteor Praha VIII.